First Eucharist and First Reconciliation Preparation is designed for six and seven year-old young disciples who have already been baptized and are preparing to receive the sacraments of Eucharist and Reconciliation for the first time. We recognize parents as the primary teachers and models of faith for their children. Regular participation in our Sunday Eucharist Liturgy, the Mass is essential! This two-year process includes the disciple’s regular participation in the Sunday Liturgy, monthly EMMAUS DiscipleFests and weekly CGS or Scripture Club sessions. In the 2nd year of preparation, an online learning program is offered to help parents prepare their children to receive the sacraments. In addition, there are two informal one-on-one conversations, which allow us to check-in with the parents/guardians and talk about the disciple’s readiness. One of these conversations takes place at the beginning of the preparation process and the other conversation prior to scheduling the actual First Reconciliation and First Eucharist dates. 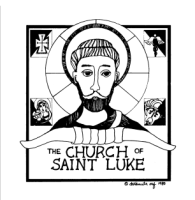 In order to help you and your child grow spiritually together, The Church of St. Luke, in cooperation with the Growing Up Catholic religious education program, have developed a series of videos to help you, the parent, guide your child through First Eucharist. The videos are designed for parents to help their children understand the monthly lessons and to help start conversations or thoughts that will help when beginning each lesson. Each video features one of our two catechists, Patty or Judy, who will guide you on your journey with your child towards receiving First Eucharist. Along with the Growing Up Catholic (GUC) video series, will also be providing links to other useful text or videos to grasp the material at hand. If you have any questions regarding First Communion preparation or the GUC video series please contact Debbie Stenovec by phone at (619) 442-1697 or by email HERE.